There’s no better illustration than the United States, which leads the world in reducing carbon dioxide emissions, largely because of increased use of natural gas. Because of natural gas, U.S. CO2 emissions are at 25-year lows. Emissions from the power sector alone plummeted 28 percent between 2005 and 2017 – again, mostly because the country is using more natural gas to fuel electricity generation. Beyond producing the natural gas that helps lower emissions as it makes people’s lives better, industry is reducing methane emissions during production – down 14 percent since 1990, as natural gas output increased more than 50 percent. The reasons for this progress are relatively simple: Capturing methane is the right thing to do for the environment – and it’s the right business thing to do. 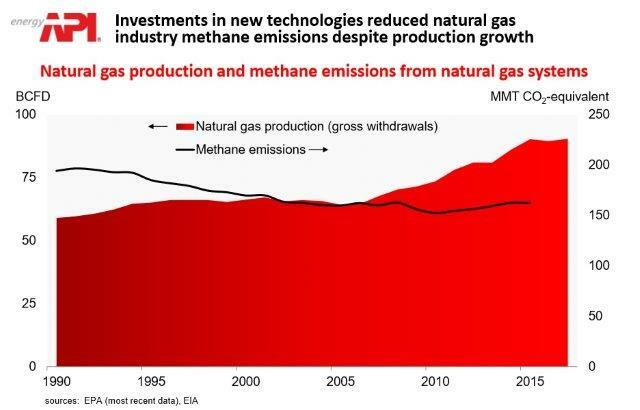 Groups such as the OGCI and The Environmental Partnership are spearheading industry efforts to retain as much methane as possible during production. Again, it’s part of an industry commitment to work for climate solutions and it’s a valuable product that can be delivered to consumers. Above: Matt Todd, program director for The Environmental Partnership, at this week’s CH4 Connections Conference. So, as the oil and natural gas industry joins others in celebrating and supporting Clean Energy Week, we do so as tangible agents of progress – in our products and operations. And in commitments to deploy the best available technologies to accelerate progress now and to develop new technology solutions for the future.